Merry Christmas and Happy New Year from the Wawel Folk Ensemble. 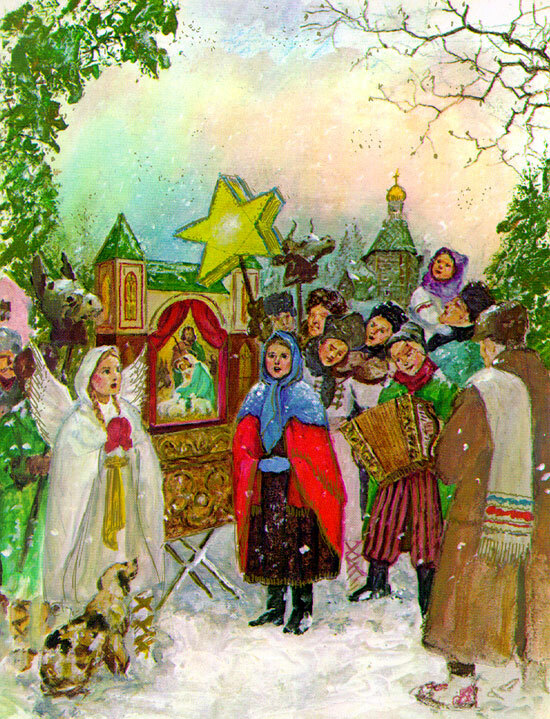 This might seem a little late for the US reader; however, in Poland the Christmas season goes on until Candlemas Day (2 February), so we're right on time. It's been a busy holiday season so far for members of the Wawel Folk Ensemble. On Christmas Eve members of the Ensemble participated in the procession at Sweetest Heart of Mary Parish in Detroit, Michigan Pasterka Mass. Wawel has been an active participant in events at Sweetest Heart of Mary for over thirty years. Likewise the parishioners, priests and staff at Sweetest Heart have been good friends to the group over the years. Also, several members have the ensemble are parishioners and have been married at the Church. On New Year's Day, members of Wawel again appeared in Polish Folk costume at Sweetest Heart. To help welcome one of the Archdiocese of Detroit's auxiliary bishops as he visited the parish. On 15 January 2012, Wawel will participate at the Radio Maryja mass and Wigilia held at Our Lady Queen of Apostles Church in Hamtramck, Michigan. Tonight Wawel will resume its practices for upcoming 2012 events. There's a lot of events already planned (some old favorites and some new adventures) so please be sure to continue to check this blog and the group's facebook page for updates. We hope to see you at one of our events during 2012.